President Donald Trump’s national emergency declaration triggered a swift and unanimous reaction among the pool of Democratic challengers hoping to take his place in the White House, a resounding dismissal of his proclaimed “emergency” at the U.S.-Mexico border. “Declaring a national emergency over this President’s vanity project is ridiculous,” Sen. Kamala Harris, D-Calif., wrote in a tweet. Declaring a national emergency over this President’s vanity project is ridiculous. We don’t need a wall. Instead, we should address the actual emergencies facing our country — everything from gun violence to the opioid crisis. “An outrageous abuse of power,” tweeted Sen. Kirsten Gillibrand, D-N.Y.
“Trump’s inability to follow through on a campaign promise is not a national emergency,” Sen. Cory Booker, D-N.J, wrote on Twitter. Under the Trump administration, lawmakers in Washington are locked in a bitter fight with the White House over the southern border as they attempt to address the challenges of an increase in crossings and apprehensions and high numbers of asylum seekers. But the issue of declaring a national emergency at the border is rife with implications for the ongoing fight between Trump and his Democratic opponents in the 2020 election. While Trump continues to cede no ground on his border wall, the 2020 trail might be a fertile ground for Democratic candidates hoping to undermine the president’s support on a signature issue. 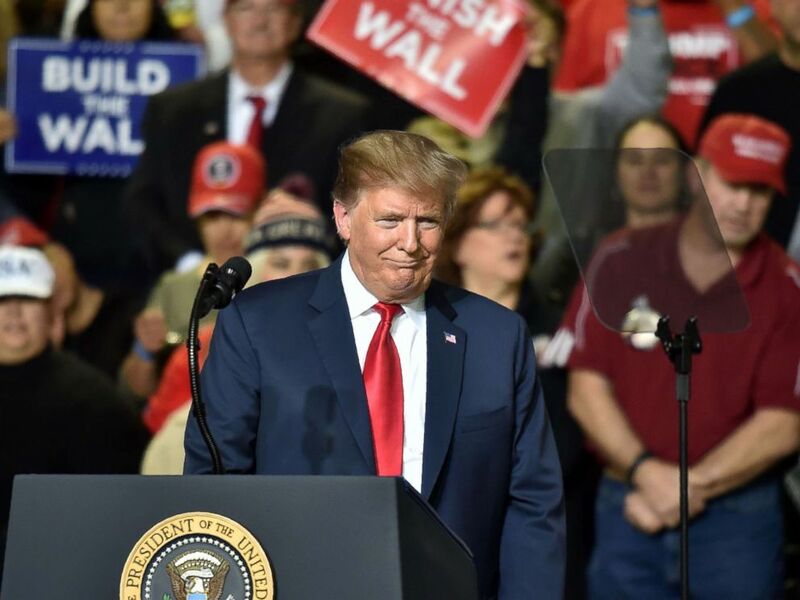 For the president, calls for a wall have been a fixture at his campaign events, serving as a rallying cry for his loyal base. But for the Democratic candidates jumping into the 2020 race, particularly those coming from the Senate, they are being tested early on how to navigate the political minefield of this issue. 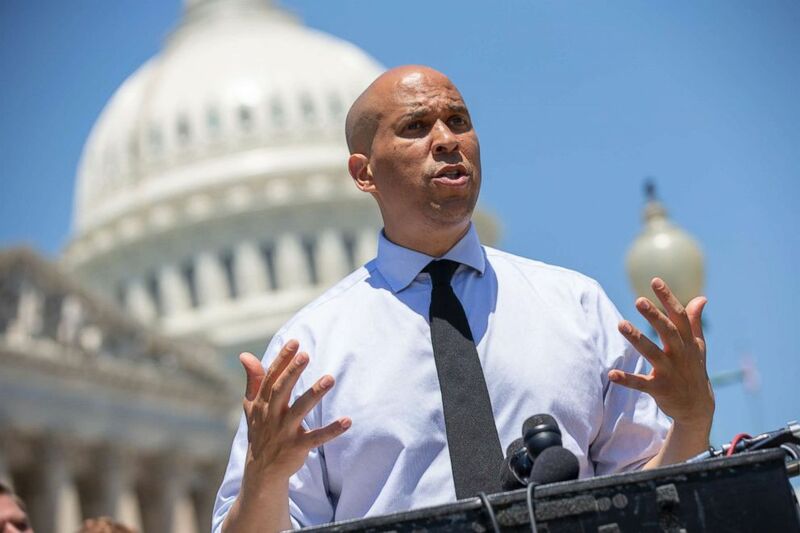 Sen. Cory Booker speaks during a news conference outside the U.S. Capitol on July 10, 2018, in Washington. During a Senate Judiciary hearing on smuggling at the U.S.-Mexico border Wednesday, Booker invoked a more personal approach during his questioning – similar to a potential rival for the Democratic nomination, former Rep. Beto O’Rourke, who frequently live streamed trips to the southwest border and captured the national spotlight during his unsuccessful bid to unseat Sen. Ted Cruz. Booker recalled his own recent trip to the border before unleashing a forceful line of questioning on Customs and Border Protection Commissioner Kevin McAleenan about turning migrants away at legal ports of entry, thus pushing them back into the perilous circumstances they hope to leave behind. “I’ve gone down myself as you know crossed into Mexico around midnight one night, I tried to come over and saw with my own eyes how people were being turned around and was told myself as an individual not to go into Mexico because it would be too dangerous for me to walk there,” the former Newark mayor began. “By turning them away, they ended up doing something that’s dangerous to them, dangerous to their children,” he argued from the dais. The hearing also provided another 2020 competitor with a platform to spotlight the humanitarian aspect of the crisis. 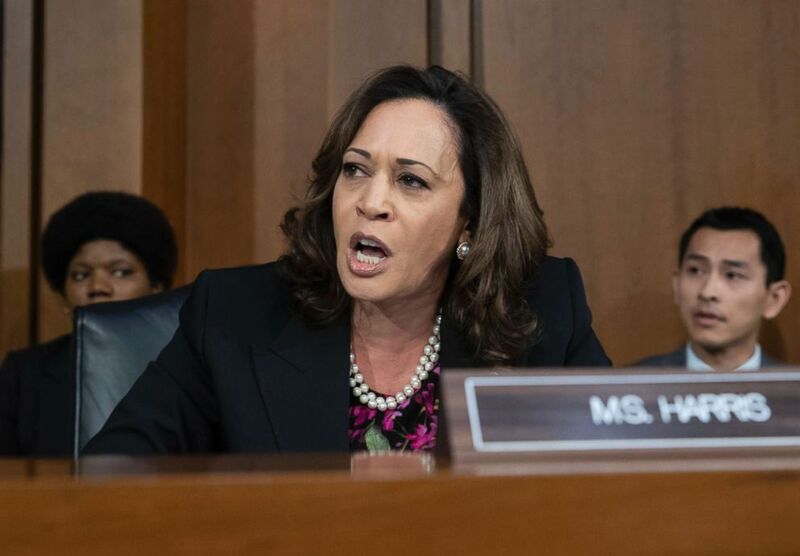 Harris engaged with McAleenan in one of the more heated moments of Wednesday’s hearing, repeatedly pressing the CBP head on the administration’s handling of immigrant children in custody, particularly amid allegations of sexual abuse in migrant shelters. “Do you believe that you have any duty or that your agency has any duty to ensure that when you transfer these children to the custody of another agency that they will be safe?” asked Harris. “I am mandated by law to transfer these children. I don’t have an ability to question it,” McAleenan said. “So you don’t believe that you have an ability to determine that upon transferring these children that they will be safe?” she questioned again. “I am required by statute to transfer these children to HHS within 72 hours,” he again responded. Sen. Kamala Harris and other Democrats on the Senate Judiciary Committee appeal to Chairman Chuck Grassley to delay the confirmation hearing of Brett Kavanaugh on Capitol Hill, Sept. 4, 2018, in Washington, DC. “Do you believe that you have any duty to raise a flag of concern that when you transfer these children to another agency that they might not be safe?” Harris asked. “I believe that’s the duty of the management and leadership of Health and Human Services, their inspector general, or the White House or Congress, not mine,” he insisted. These types of exchanges offer a preview into how the field of Democratic candidates might tackle one of the core issues of Trump’s platform — and eventually take on the president himself — as support for his national emergency declaration appears to be faltering. Trump announced the declaration in February to divert government funding for his border wall, but amid rising tensions, key Republicans on Capitol Hill have begun to abandon the administration over this issue. Earlier this week, Sen. Rand Paul, R-Ky., joined a growing coalition of GOP members, including Susan Collins of Maine, Lisa Murkowski of Alaska and Thom Tillis of North Carolina, who said they would defy the president, ensuring that a vote on a resolution to block the president’s unilateral move would pass. 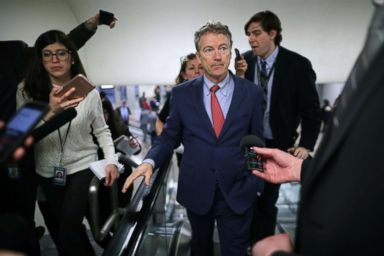 Sen. Rand Paul (R-KY) talks to reporters as he heads to the Capitol for the weekly Republican policy luncheon, March 5, 2019, in Washington, D.C.
Paul told reporters Monday there are “at least 10” Republican senators who conceded that they will vote to disapprove of the declaration. The Senate must vote on the House-passed resolution by the end of next week. On Wednesday, one of the administration’s top border officials even suggested that he backed fixing the current immigration system through legislation over investing in more funding for barriers. During the hearing, McAleenan asserted that a majority of traffic at the southern border would be addressed by amending the laws. “If you had a choice between closing or changing the laws and money for barriers or anything else, what would be your top priority,” asked Chairman Lindsey Graham, R-S.C.
Commissioner of Customs and Border Protection Kevin McAleenan testifies during a Senate Judiciary Committee hearing, Dec. 11, 2018 in Washington, D.C.
“I believe we need both Mr. Chairman. 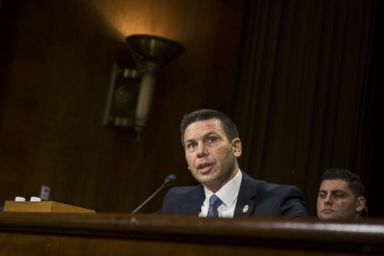 But the immediate impact, 63 percent of our traffic at the border, would be addressed by a change in the laws,” McAleenan said before the Senate Judiciary Committee. “This humanitarian law enforcement situation sounds like a crisis to me, sounds like an emergency to me, would you agree,” posed Sen. Josh Hawley, R-Mo. “It’s absolutely a crisis,” McAleenan responded.